At least this way it makes sense. “It’s a grey area” is the oft-cited rationalization for morally ambiguous shiftiness. 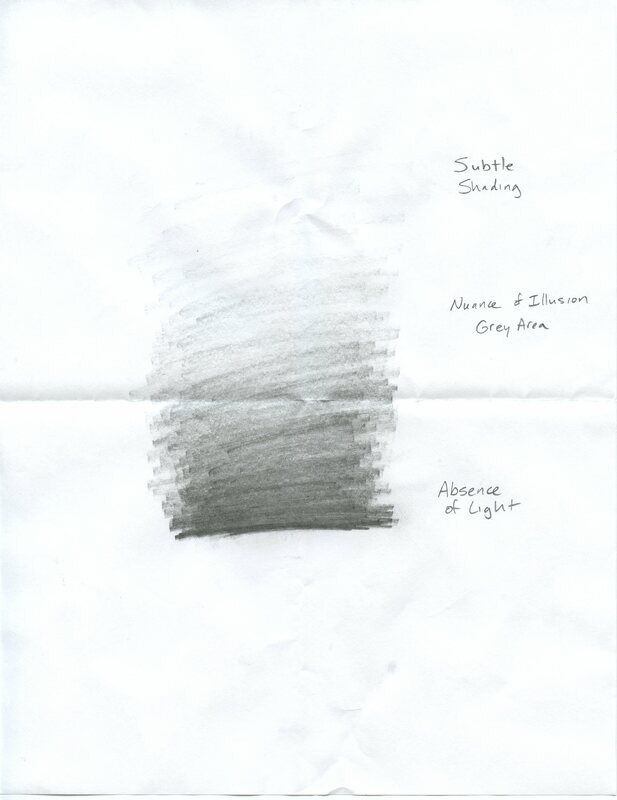 I was recently talking with a graphic artist about K1, what he imparted on me is that the term subtle shading refers to a method of applying a gradient in discreet packets. The example he gave is vector shading, the requisite being a clear delineation between each gradient. Heres something seemingly noteworthy, varying hues in which lightness and saturation are equivocal are said to be of the same “nuance”. The other distinction he made is that shade refers to a decreased lightness of an equivocal hue and saturation… as in tint, tone, shade. So if the absence of light is a lightness of 0 perhaps subtle shading means only values that correspond to natural numbers <50% on the scale… such as Munsel values 1-4 or Y values 1-49. Sanborn has expressed that he's a sculptor and photographer, not a graphic artist. Given that colorimetry really has more practicality in photography and that the nature of his previous works almost always dealt with projection, I must again return to the idea of the plates being like a film or filter. I mean not to beat a dead horse, but we must keep in mind that radio and film where still the paramount in information gathering when Sanborn started this endeavor, and radio is already implied in K0, and K2. I'll entertain some moon logic here, but a "nuanced" illusion that comes to mind is rainbow holography… K5?